About Us | Detro Trailers | New and used car haulers, enclosed cargo and utility equipment flatbed trailers | Indianapolis, IN. Detro Trailer Sales evolved from several business ventures of Dan and Jessie Detro. Starting in the 1960’S, Dan was in the crushed stone and dump trucking business; then opened a gravel plant and started buying grain from local farmers due to the local elevator closing. The original property was purchased for this in 1979 and during the off season, they sold used cars and started a produce business. After a few years these ventures were closed and a new one started, selling tools. With the addition of several small buildings, new items were offered, sunglasses, t-shirts, gifts, toys, and china cabinets. Storage became a problem when decorative pillows were added so Dan purchased a small used enclosed trailer for them. This created a new problem; people wanted to buy the trailer. Thus, the trailer sales were started in August of 1990 with an inventory of five and sales of three the first year. As the business grew, more land was added and the inventory reached 1,000. 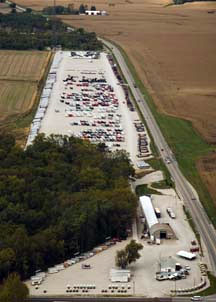 In the early 2000’S an auction was held to sell all of the merchandise and buildings except for the trailers. Today, over twenty years later Dan and Jessie have retired and the business is still thriving under the leadership of their son Tony and his wife PJ and their three children. Their main objective remains to provide good customer service and offer a quality trailer at the best possible price.